To evaluate the leadership potential, intellectual ability and personal goals and values of their MBA applicants, business schools have long relied on a stable mix of components – academic transcripts, standardized tests in the form of the GMAT and GRE, a resume, essays and letters of recommendation. A number of schools have played with the format in recent years, introducing additional components to assess the personalities and thought processes of candidates. For Chicago Booth you can now put together a four-slide Powerpoint to broaden the admissions committe’s perspective about who you are, while Georgetown’s McDonough School of Business asks you to explain why you want to do their MBA in tweet format. But to gain a deeper understanding of a candidate’s interpersonal skills and communication style, nothing seems to beat the interview. A handful of business schools including the Tuck School of Business and Northwestern’sKellogg offer applicant-initiated interviews as part of the application, but the University of Toronto’s Rotman School has taken the idea a step further and replaced one of its traditional written essays with a video interview. After logging on and practicing with as many non-recorded sample questions as they want, interviewees then get two questions, the first common to all applicants, and the second selected by the computer from a bank of questions pre-recorded by da Silva. They are given 45 seconds to think about their response, and then have 90 seconds to answer. “There is no preparation required, and no right answer”, says da Silva. “They might be asked to talk about an event that has inspired them, or reflect on how their colleagues might describe them. It is telling to see what jumps to mind, and we get a glimpse into their value system and perspectives we don’t see elsewhere in the application”. For the time being, most business schools only offer an interview after a candidate has submitted their written application, so being selection to interview is the first major hurdle on the road to a place at the school of their dreams. Last year for example, the Harvard Business School received over 9,500 applications, the majority of which were for the first two rounds of admissions in late September and early January. From these, the school sent out 855 invitations to applicants in the first round, with similar numbers in the second round. Given that the school typically admits around 90% of its 900 students from the first two rounds, the chances of admission success for interviewees have just improved dramatically – around 1 in 2 depending on the school. But what sort of interview will you face? The Wharton School has also taken a step back to look holistically at the different pieces of the admissions process, and have recently introduced a Team Based Discussion as part of their interview format. For Director of MBA Admissions, Ankur Kumar, the three areas that collectively make up the school’s evaluation – academic backgrounds and achievements, exceptional professional trajectories and accomplishments, and individual personal qualities such as judgement, self awareness, thoughtfulness, leadership style, interaction with others – are all considered equally important. In thinking about how they could evolve the process, the Team Based Discussion emerged for two primary reasons. “We often heard from our applicants that they sometimes felt limited in their ability to showcase aspects of themselves in their written application. The Team Based Discussion is the chance for them to show us, versus telling us in the written application or one on one interview. 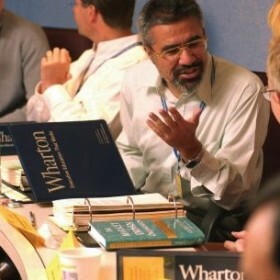 This is the first year that Wharton has formally launched the Team Based Discussion as part of the admissions process, having piloted the format last year with current students, and round three candidates in the spring of 2012. The Wharton admissions team is now preparing the next series of Team Based Discussions, both in Philadelphia and various locations around the world, for selected applicants from round two. Kumar is convinced that the new format has an important role to play. “As we are going through our applicants’ files we are always trying to visualize them in the program. I think this has really added some richness to our ability to visualize them here at Wharton. And it really does give candidates a chance to get a good sense of who we are at Wharton, and how we operate. Click here for the full transcript of the interview with Wharton Director of MBA Admissions Ankur Kumar, including more details about the team based discussion and admissions advice to applicants.